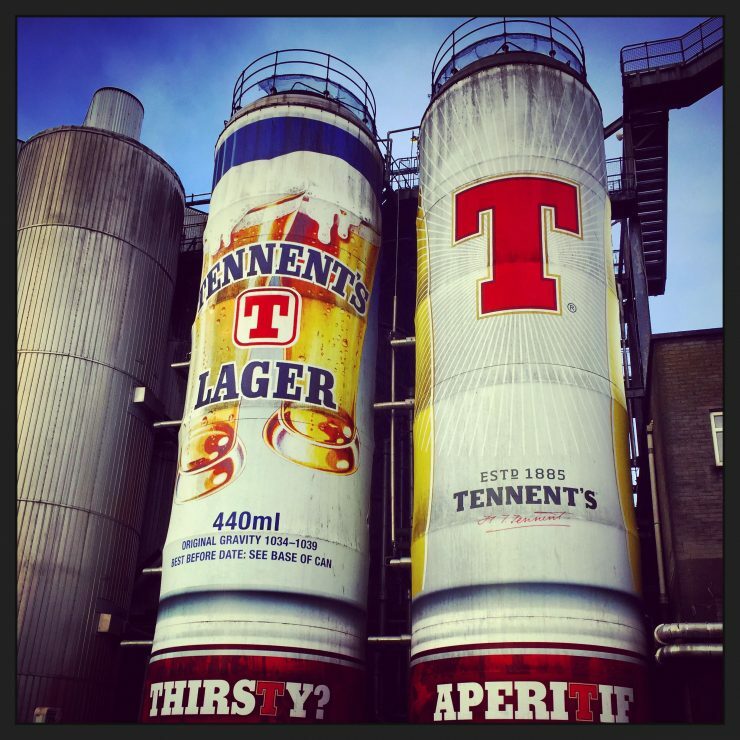 If you’d asked me which breweries I was itching to explore, I’ll be honest – I wouldn’t have selected a Tennent’s tour. As a Scot maybe I should have been prouder of this national drink, but I’ll admit it, beer snobbery crept in. It’s not that I’ve never been a Tennent’s fan. 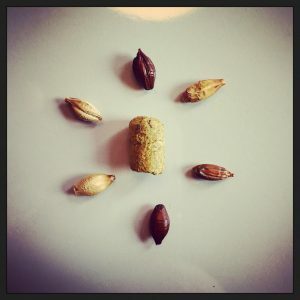 When I was in my late teens I remember going to T in the Park, slugging pints and proudly sporting nailpolish painstakingly designed to feature the iconic Tennent’s letter T.
But I developed a taste for stronger, malty beers and went off watery lagers, rendering this brewery one that was consigned to my past. Until recently, that is, when I was invited to join my brother on a Tennent’s tour – and I loved it. This was actually the first lager in the UK to be produced on a commercial scale and it was fascinating getting to see this massive operation. You also learn about the history of the iconic Scottish drink and how it developed into the massive brand it is today. The brewery is in Glasgow’s East End and the tour kicks off with an induction in the visitor centre. 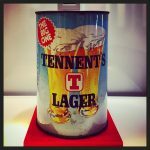 It’s jam-packed with Tennent’s memorabilia and the guide talks you through it and shares some really interesting nuggets of information. 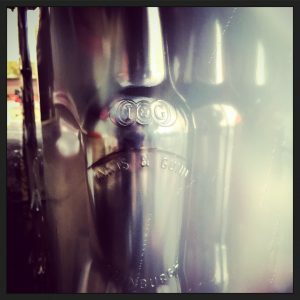 You can see one of the very first Tennent’s bottles – a dumpy, stoneware bottle which dates back to the 1900s. Apparently they can fetch a pretty penny today. The brewery was amongst the pioneers of canned beer, moving to cans in the 1930s because they were lighter (therefore cheaper to freight) and durable. The guide told us the earliest cans had a metallic taste (boke!) but the design and materials changed and evolved over the years and there were various styles on show. It wasn’t even the biggest can on show – there was a bucket-sized “party can” in 1978 filled with two-and-a-half litres of lager (see pic, right). Tennent’s did continue in its quest to market to women though, with cringeworthy ‘housewives choice’ cans featuring housewives and meal recipes. These included one questionable suggestion of stuffing a steak with a banana (seriously) and pouring lager over it. I do love a steak but I think I’ll be giving that one a miss! The recipes might not have made an impression but the women certainly did and Tennent’s was inundated with letters asking for pin-up pics. Spotting an opportunity, it launched its famous Tennent’s Lager Lovelies cans featuring a whole series of pin-ups who were somewhat less conservative-looking than the housewives, with some even deemed too risque for the US market. At this point I should mention that if you aspire to be a Lager Lovely you can realise this dream in the visitor centre where a webcam will snap your photo and emblazon it on the side of a giant can on a big screen. I resisted the urge but the temptation was too much for my brother who can now claim to be a bone fide Tennent’s boy. Before you head outside there’s a health and safety chat where they give out hi vis vests and very fetching blue hairnets – or you can fork out a few quid for a baseball cap if your’re too cool for that. I’m not cool – I went for the net. When we set off I was grateful for the walking and the various staircases because it was bitterly cold outside – bear this in mind and wrap up if it’s chilly. They passed round hops and malt for us to feel and smell and walked us through different stages in the brewing process – although sadly no pictures were allowed in the actual brewery. I behaved and didn’t break the rules – to make up for it the brother and I snapped silly selfies in our stylish hairnets. There was something weirdly satisfying and hypnotic about watching the cans whirring pa st on the production line. Back in the day, staff used to get to keep damaged cans but this perk was apparently ditched when a suspicious number of cans were deemed ‘damaged’. But there are still perks, with a generous beer-token system in place which staff accrue and can cash in for free lager, or they can save up their points and even trade them for bubbly. Interestingly enough it wasn’t just Tennent’s cans whirring past. I learned that the brewery actually takes on contracts bottling and canning for loads of big brewers, and as I scanned the factory floor and the crates piled up outside I spotted a few recognisable names. Menabra and even Innis & Gunn were amongst the names I spotted while on the tour. As we reached the end of the tour they took us through the Tennent’s Training Academy, and some of the classes looked quite cool. I checked out the website when I got home and Beer Yoga is definitely on my to-do list this year. I thought the tasting session at the end would be a bit run-of-the-mill (after all, I’ve had this lager before) but again I was proved wrong. We started with a pint of Tennent’s which I lapped up with enthusiasm because I hadn’t even had time for breakfast (lager for brekkie, the shame!). Then there were a few surprise extras. They gave us a taster of Tennent’s Scottish Export Stout (ABV 4.7%) which apparently pairs well with seafood and desserts. Next up was Tennent’s Beer aged with Whisky Oak (ABV 6%) which was surprisingly good and one I’d definitely have again. And they saved the best for last as the guide presented us with a taster of a bock beer made only for export – Tennent’s Extra (ABV 9.3%). What a shame it doesn’t sell over here because this is the beer that would get me running to the supermarket for this brand – it was so delicious and malty! My one and only complaint was the ability to hear the tour guide – if you were at the back of the group you really had no chance of hearing everything the guide was saying – although to her credit she tried to move up and down the group as much as possible. But I was envious when I saw rows of headsets laid out for the tour group that left after us – apparently their guide ‘had a cold and couldn’t shout’. I asked why they didn’t do this for everyone and was told there simply weren’t enough headsets. It’s a shame because, for a modest investment, they could really enhance the experience and allow everyone to enjoy it to the full. 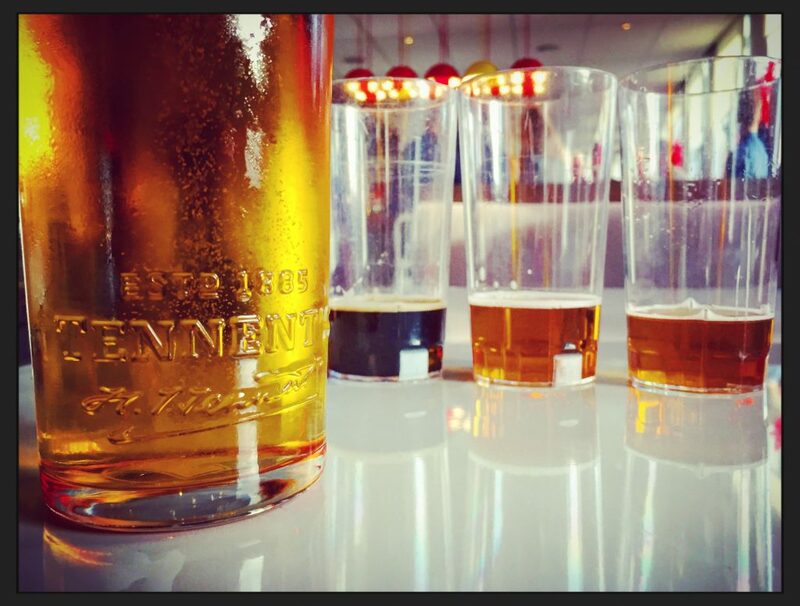 Whether or not this is your drink of choice, this Tennent’s tour is well worth checking out. It costs a modest £10, £8 concession, £7 for students or £25 for a family of two adults and two children, and it’s great fun.